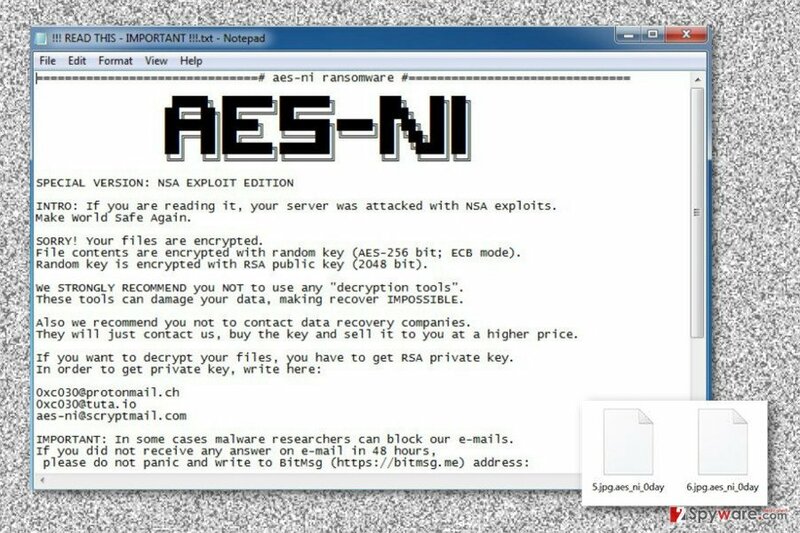 .Aes_ni_0day ransomware uses sophisticated techniques to infiltrate computers and hide from its victims. Use Reimage to determine whether your system is infected and prevent the loss of your files. .Aes_ni_0day file extension virus is a new variant of AES-NI ransomware. It’s a “special” version of the virus which is called NSA EXPLOIT EDITION. However, it behaves similarly like the original virus. The purpose of the ransomware is to encrypt databases, documents, audio, video, image and other files using a random AES-256 encryption key, which is encrypted with an RSA-2048 public key. In the ransom note called “!!! READ THIS – IMPORTANT !! !.txt“ authors of the ransomware inform how victims can unlock files that have .Aes_ni_0day file extension. People need to contact cyber criminals via provided email addresses and wait for the instructions how to obtain a private RSA key to restore data. Though the scenario is quite obvious – cyber criminals will ask to transfer particular amount of Bitcoins. But instead of paying the ransom, victims should focus on .Aes_ni_0day removal. Cyber criminals may not provide safe and working decryption key. Besides, they might ask for more money and threaten to delete all the files. Ransomware is blackmailing program that must be terminated from the device using reputable security software, such as Reimage. .Aes_ni_0day file virus attacks computers using various distribution strategies. After infiltration, malicious files and components are installed in the %System Drive%, %AppData% or %Windows% directories. Then it modifies Windows Registry to run the virus on the system startup, insert malicious code into legitimate Windows process svchost.exe, and deletes Shadow Volume Copies. However, malware has one quite unique feature. As soon as it gets on the device, it checks whether the computer belongs to users from the former Soviet Union block, or not. If so, malware deletes itself. Otherwise, after the attack, people need to remove .Aes_ni_0day malware themselves. Nevertheless, ransomware removal will not bring back access to the encrypted files; this step is crucial in order to protect your computer, data and personal information from other cyber threats. Once the virus is wiped out from the system, you can recover your files from backups or try alternative recovery methods. .Aes_ni_0day file virus is a new version of the AES-NI ransomware. In order to remove .Aes_ni_0day file extension virus from the device, you need to obtain reputable malware removal program. 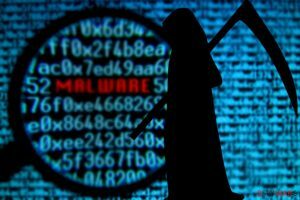 As we already explained, malware injects malicious codes in legitimate system processes, and makes entries in Registry; thus, manual removal is nearly impossible without damaging the system. Only professional security software can delete malware safely from the device. We recommend completing this task using Reimage, Plumbytes Anti-MalwareMalwarebytes Malwarebytes or Malwarebytes MalwarebytesCombo Cleaner. 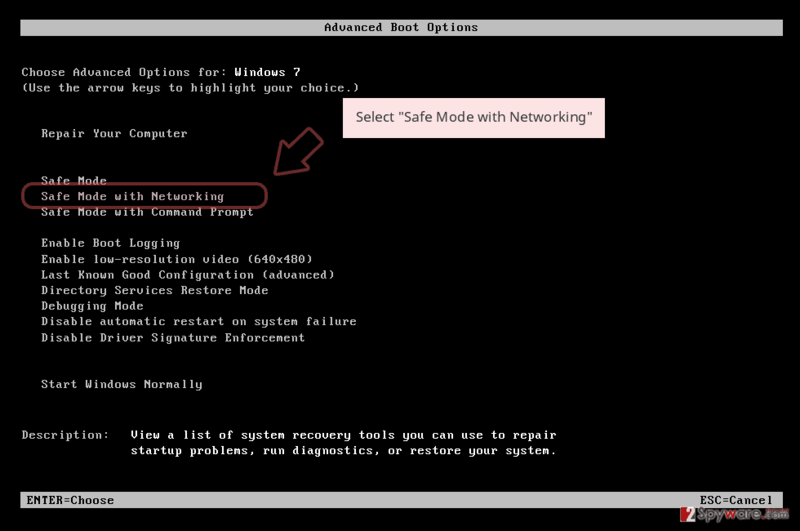 Before installing one of these tools, you may need to reboot your device to the Safe Mode with Networking. Unfortunately, .Aes_ni_0day removal won’t restore encrypted files. For that, you need additional tools. Below you will find our tips and tricks that may help to recover at least some of the encrypted records. 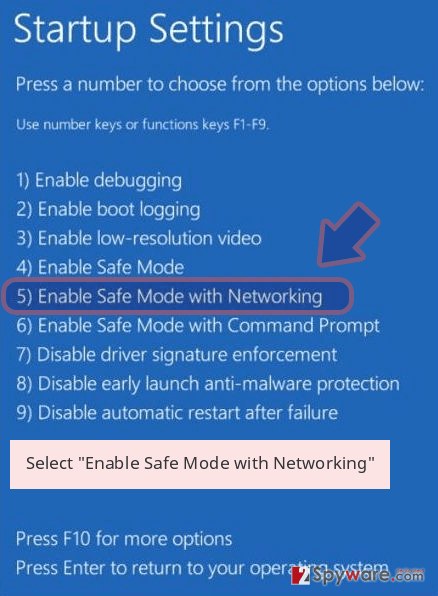 In order to perform automatic ransomware removal, you need to reboot your device to the Safe Mode with Networking. Then, install, update and run a full system can with your preferred security software several times. Log in to your infected account and start the browser. Download Reimage or other legitimate anti-spyware program. Update it before a full system scan and remove malicious files that belong to your ransomware and complete .Aes_ni_0day removal. 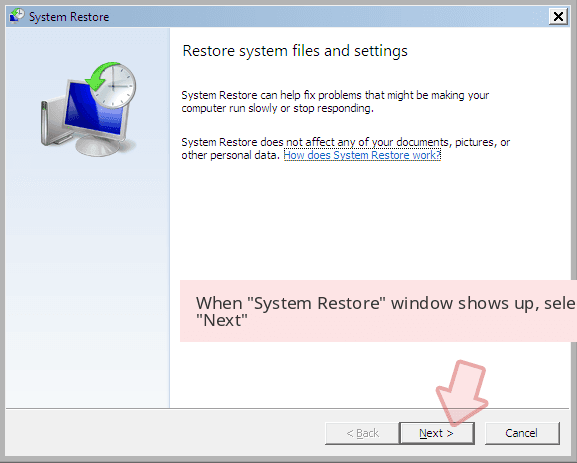 System Restore also helps to disable .Aes_ni_0day file virus and run automatic removal with malware removal program. 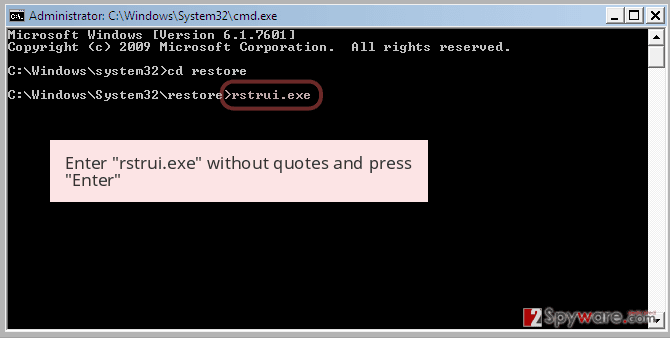 When a new window shows up, click Next and select your restore point that is prior the infiltration of .Aes_ni_0day. After doing that, click Next. 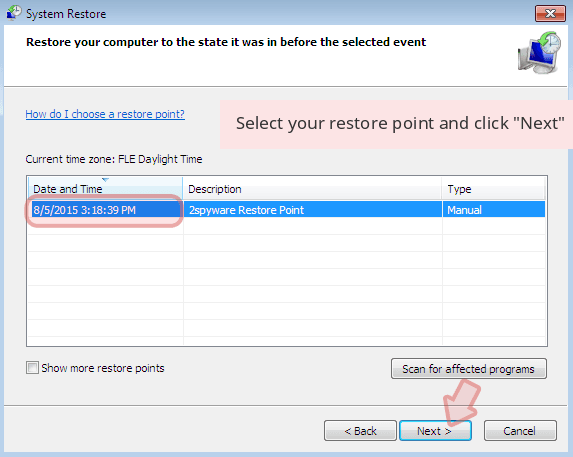 Once you restore your system to a previous date, download and scan your computer with Reimage and make sure that .Aes_ni_0day removal is performed successfully. 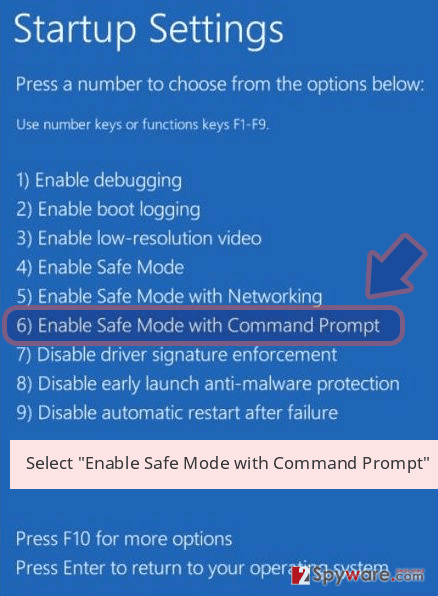 Guide which is presented above is supposed to help you remove .Aes_ni_0day from your computer. To recover your encrypted files, we recommend using a detailed guide prepared by 2-spyware.com security experts. After virus removal, you can use data backups and restore your files from them. If you do not have backups, please these methods a try. We cannot assure that this will be 100% effective; however, you do not have what to lose! With the help of Data Recovery Pro, you can restore at least some of the encrypted files. Follow the steps below. 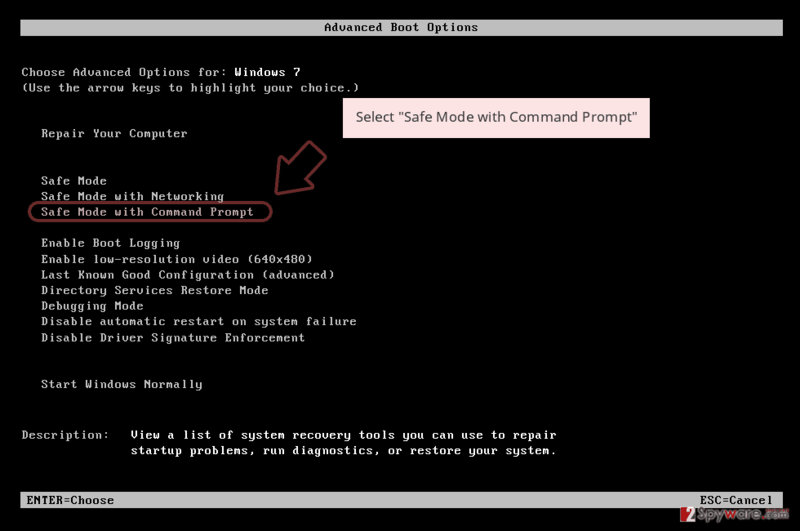 If System Restore method has been enabled before .Aes_ni_0day file virus attack, you can travel back in computer’s time and copy individual files. Thus, this method is only effective and useful if you need to recover only a few files. ^ Olivia Morelli. Why should you not rush paying the ransom?. NoVirus. How to get rid of computer viruses. ^ Lee Mathews. Hospital pays ransom, ransomware demands more money. Geek.com. Tech News, Reviews & Tips. ^ Walter Glenn. What Is the Service Host Process (svchost.exe) and Why Are So Many Running?. How-to Geek. Includes help, tutorials, tips and how-to guides for Windows and Linux. ^ JP Buntinx. AES-NI Ransomware may be Using Recently Disclosed NSA Exploits. The Merkle. 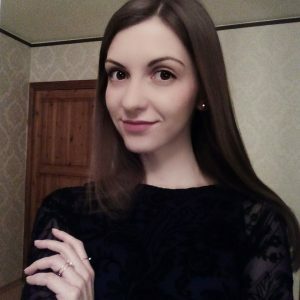 The latest Crypto, Finance, Infosec, Tech, and other hot news. This entry was posted on 2017-04-25 at 02:52 and is filed under Ransomware, Viruses. 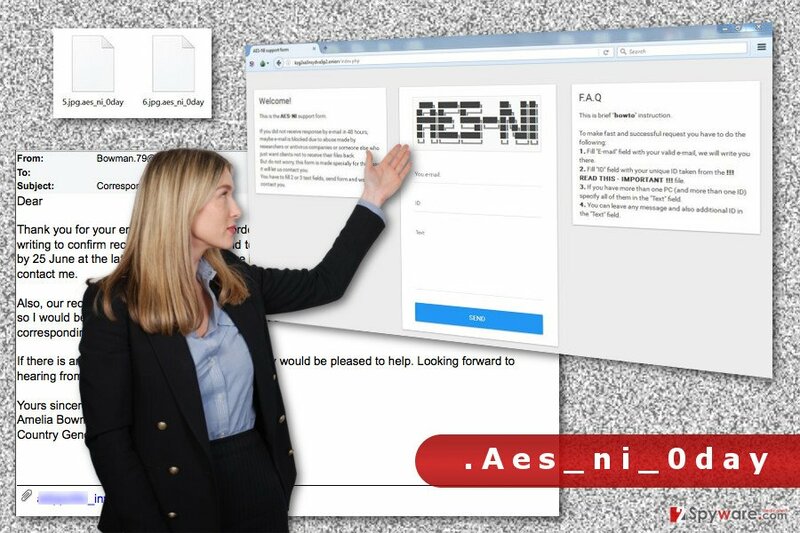 You can quickly scan the QR code with your mobile device and have .Aes_ni_0day file extension virus manual removal instructions right in your pocket. How did you remove .Aes_ni_0day virus?